[UPDATE]: Hugo’s union IUPAT has organized a National Call-in Day for June 19th. Take a few minutes to call the San Francisco ICE Field Office and demand Director David Jennings release Hugo and Rodrigo! Sample script below. It’s less than a week until Father’s Day and Hugo Meijia Murguia and Rodrigo Nunez are living a nightmare. They are stuck in a detention center, separated from their children, uncertain about what will happen to them. Their union brothers and sisters are fighting like hell to help them. The impact of a broken immigration system is affecting every community across California. US Immigration and Customs Enforcement (ICE) has detained thousands of people in the past few months across the country. The detainment of undocumented immigrants without criminal records has been on the rise under the Trump Administration. Washington Post reports that “arrests of immigrants with no criminal records more than doubled to nearly 11,000, the fastest-growing category by far” compared to previous years. Normal routines like dropping off your kids at school, answering the front door, and going to work no longer feel safe for far too many of our brothers and sisters. Families are being torn apart. Communities are living in fear. What has happened to Hugo and Rodrigo in particular hits close to home in the house of California Labor. Hugo has lived in the United States for fifteen years and has been a member of the International Union of Painters and Allied Trades (IUPAT) Local 83/District Council 16 for four years. He has built a life in San Rafael and is beloved by his wife and three young children. He volunteers regularly at his children’s school. Rodrigo, a member of Carpenters Union Local 68 has also been living in this country for more than a decade with his wife and three children. 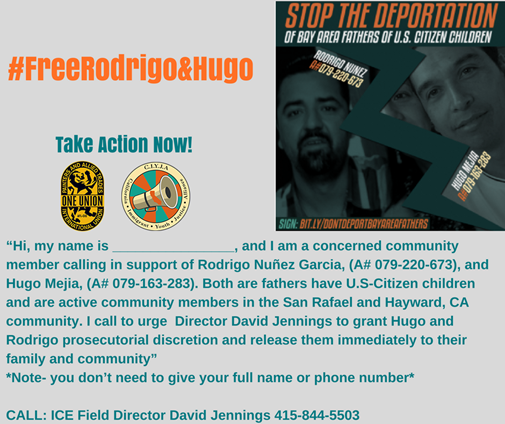 Hugo and Rodrigo’s families and communities need them back home. On Wednesday, May 3, 2017, Hugo showed up to work like any normal day. He was working on a construction job at a hospital and had no idea that it was on a military base, much less that he would be required to present a social security number. He presented his valid California-issued driver’s license and his ITIN (individual taxpayer number). He was completely unaware that this would cause the military to detain him and call ICE. He and another union brother, Rodrigo Nunez, were then detained at Travis Air Force base for two hours before being transferred to an ICE detention facility. Over a decade ago, Hugo received a “Removal Order” for entering the country which triggered an expedited deportation process. Hugo has had a pending asylum case throughout this ordeal and is still behind bars as you’re reading this. ICE has full discretion to release Hugo from custody while his asylum case is reviewed. There is no reason why Hugo and his family should be separated. IUPAT is demanding ICE immediately release both Hugo and Rodrigo so they can be with their families while their cases are being reviewed. Join them! 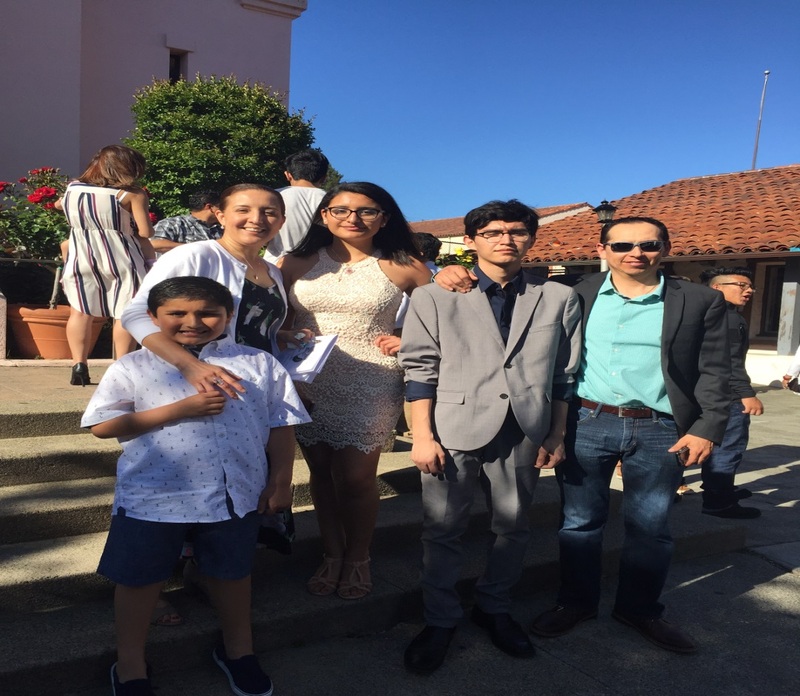 There are ample opportunities to help Hugo and Rodrigo and their families. Folks can sign a petition calling for their release here. You can also donate to Hugo and his family via GoFundMe here.